Fit-Ink: Seen on the Run: What's Up With That? I've been to Colorado plenty of times, but I've never traveled south of Denver. Until my most recent trip. And instead of going to the usual haunts--ahem, Vail and Boulder (OK that was only once but I fell in love)--I headed south to the state's second largest city, Colorado Springs. Home of the Air Force Academy, the United States Olympic Training Center, the U.S. Olympic Committee and several other sports organizations from swimming to triathlon. And as I learned while I was there, the doctor who developed ART, active release technique (which saved me from a summer of not running), is based in the Springs. So the secret's out. If you saw the Fit-Pic in the previous post, it's from Colorado Springs (as if I didn't already give it away at the start). When you're in the fittest state in the nation, you can't help but want to explore, especially when that exploration includes a run. Apparently that's the southern facing view when you're running along the Springs' equivalent to Chicago's Lakefront Path, Monument Valley Park. Or at least I think it's Monument Valley Park, you never know when your claim is based on a satellite picture. The path runs along a creek, offers a trail to tackle on the creek's west and east sides, and is mere steps from downtown and Colorado College. And it's flat, relatively speaking, perfect for this girl who never runs hills and already needed to adjust to the 6,000-plus feet of elevation. Sounds perfect, right? Not in my book. 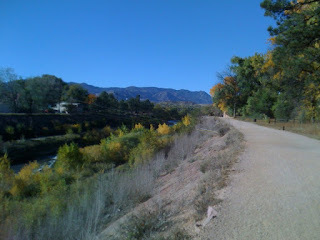 Once I learned that this trail linked to another trail network that could take you to the Broadmoor area of town (site of the famous Broadmoor Hotel), I was sufficiently bummed that it wasn't paved. The gravel works for runners--hooray for no pavement pounding and achy, breaky joints--but not so much for cyclists looking to avoid road traffic. I'm the cyclist who'd prefer the path, a paved one though, over the road. The other dealbreaker: the complete lack of water fountains. I found a lone fountain my second time on the trail, but I ran more than a mile before spotting it. I know I'm nit-picking, but I'm skipping water fountains on my Lakefront runs because there are so many. Thank goodness for some trail running essentials I packed this trip--I wasn't going thirsty with the Mountainsmith Dart wrapped around my waist. By now you'd think I would have learned my lessons: this trail is for running, maybe recreational cycling to prepare for some off-roading, and that you need a water bottle if you're going to run more than a few miles (and it's a necessity on a warm day regardless of the distance. But there was one more: Don't mess with the trail during cross-country season. 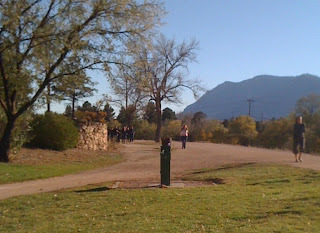 I ran into a cross-country team, literally. Me versus a swarm of girls who were running in one large spread-out pack. You can guess who had to bail into the grass when they refused to run a little closer together to let oncoming traffic use the trail too. But then again, it did make me feel like I was back at home. How many times have I had to dodge traffic and random path darters, especially when I'm riding my bike, along the Lakefront? Yeah, some things never change.